The Cleveland Browns selected Penn State defensive end Courtney Brown with the top overall pick in the 2000 NFL Draft. Brown would go on to spend his first five NFL seasons with the Browns, but only appeared in only 47 games during that span. Brown finished his NFL career with 156 tackles, six forced fumbles and 19 sacks. Brown became only the 11th defensive lineman to ever be taken with the top pick in the draft. Brown’s Penn State teammate and linebacker LaVar Arrington was taken by the Washington Redskins with the second overall pick in the 2000 NFL Draft. The Redskins also had the third pick and used it on offensive tackle Chris Samuels. At number four, the Cincinnati Bengals selected Florida State wide receiver Peter Warrick. The Baltimore Ravens rounded out the top five by selecting Tennessee running back Jamal Lewis. 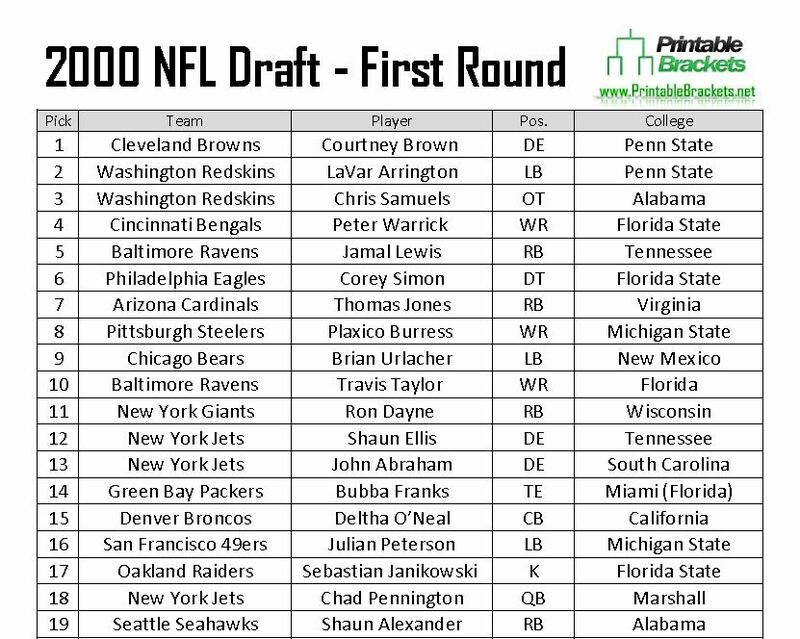 Eight future Pro Bowlers were taken with picks 12-19 in the first round of the 2000 NFL Draft. Defensive end Shaun Ellis, fellow defensive end John Abraham, tight end Bubba Franks, cornerback Deltha O’Neal, linebacker Julian Peterson, kicker Sebastian Janikowski, quarterback Chad Pennington and running back Shaun Alexander were all taken consecutively in round one. The 2000 NFL Draft is perhaps best remembered for the selection of Tom Brady. The New England Patriots selected the Michigan quarterback with the 199th overall pick in the sixth round of the 2000 NFL Draft. There were six quarterbacks drafted ahead of Brady: Pennington, Giovanni Carmazzi, Chris Redman, Tee Martin, Marc Bulger and Spergon Wynn. “Mr. Irrelevant” of the 2000 NFL Draft was Northwestern State safety Mike Green, who was taken by the Chicago Bears with the 254th overall pick. Green went on to play for the Bears, Seahawks and Redskins over nine NFL seasons. Notable players who weren’t selected in the 2000 NFL Draft include center Shaun O’Hara, wide receiver Michael Lewis, kicker Shayne Graham and defensive end Adewale Ogunleye.